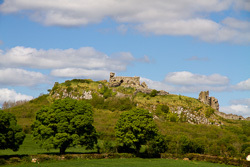 County Laois is reputed as 'the most landlocked county in Ireland' as it uniquely does not border any other counties with a sea coast. The Slieve Bloom Mountains are predominantly in County Laois although the border with Offaly runs through them. Glenbarrow waterfalls are located just a few miles from Clonaslee and there are many scenic walks to and from the falls. The Slieve Bloom, along with the Massif Central in France, are the oldest mountains in Europe; they were once also the highest at 3,700m. Weathering has reduced them to 527m. On a clear day, one can see the high points of the four ancient provinces of Ireland. 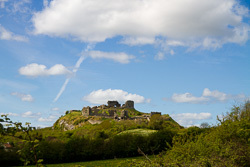 One of the beauties of Laois, the Rock of Dunamase, is one of the most historic sites in Ireland. Its ruins date back many hundreds of years. The Rock stands 150 feet (46 m) tall in the heart of what is otherwise a flat plain, and was ideal as a defensive position with its view right up to the Slieve Bloom Mountains.